An independent ROI study of Riverbed® Cascade® product family customers, conducted by IDC in April 2010, found a remarkable three-year ROI of 364% and a payback period of just 5.5 months. Cascade provides cost-effective, application-aware network performance management that enables end-to-end visibility into the performance of critical business applications. Cascade is the only network performance management solution to combine flow data and packet data into a single logical data store. 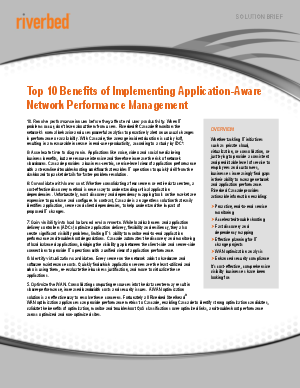 Read 10 Benefits of Implementing Application-Aware Network Performance Management and learn how Cascade enables: proactive, end-to-end service monitoring, accelerated troubleshooting, fast discovery and dependency mapping, effective planning for IT change projects, and more.